Why isn’t it enough to call 811? While a public utility locating service such as 811 should always be your first call, these services focus ONLY on public utility location. This leaves you with the dangerous potential of hitting any private utilities they failed to locate. Calling a private utility locating service in addition to 811 will ensure you uncover all buried utilities before digging or working in an area. What happens if you dig first before locating utilities? What happens if you hit a buried utility? Hitting a buried utility can cause injury or death, damage to equipment, and damage to the utility itself. Repairs can be costly and time consuming, often requiring the digging up of the entire length of pipe, cable or conduit. Damage can disrupt neighboring systems, causing issues such as internet outages or area flooding. Is it dangerous to hit a buried utility? Yes- hitting a buried utility can be extremely dangerous! Workers and those in the area can be injured or killed by electrocution, gas main explosion, flooding, sinkhole conditions, and more. Strikes can damage equipment, causing it to malfunction or trap the operator. What happens if you cut or core concrete without scanning it first? Concrete contains rebar, post-tension cables, and other structural elements. It can potentially hide conduit, voids, and other elements which create a hazard if they’re disturbed. Cutting or coring work can damage or destroy these elements, causing immediate or long-term structural failure. What happens if you damage a concrete structural element? Damage to post-tension cables within concrete can cause them to snap, potentially injuring or killing someone. Damage to cables and rebar can cause immediate catastrophic structural failure of the concrete, or can weaken the concrete and lead to failure down the line. How can ground penetrating radar keep me safe? GPR and complimentary tools can be used to accurately identify buried utilities, voids, and other subsurface findings as well as structural elements within concrete. This takes the guesswork out of your excavation, cutting, or coring, enabling you to work safely without the fear of hitting anything. Why should I call GPRS for my utility locating and concrete scanning needs? GPRS has nearly two decades of specialized knowledge in the fields of utility locating and concrete scanning. 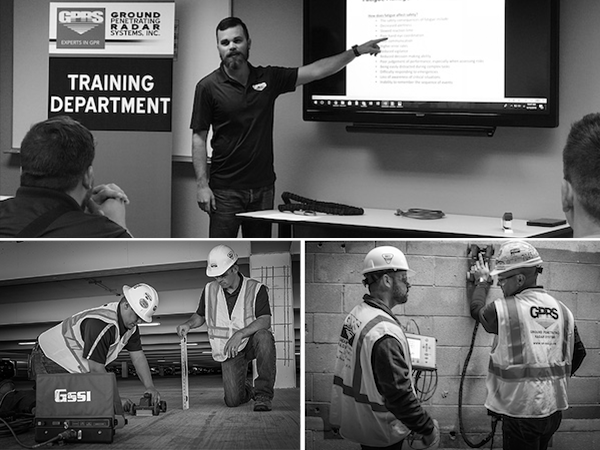 Our team members receive training that goes above and beyond industry standards, ensuring they are experts in the latest GPR and scanning technology. Our widespread office network means that a local Project Manager can visit your site as early as 24 hours of your contacting us. We utilize an array of equipment to ensure that your site is accurately assessed, providing you with the best results so you can continue to work safely.